Dear Vicky this looks so lovely. Thanks for sharing. Love this on the Ikea chair (my parents have this chair and it is super comfy!). Looks just like the big one!! Very cute! i so need a yo-yo maker.. and then i can do all your projects!! I'm on my way--you are definitely a creative one! Have an awesome week! This looks good...I am going to check it out. Very sweet! Congratulations on another great MBS post. Boy you are busy! Love the tutorial. Thanks for sharing! cute cute! Checking it out now. Just another adorable project Vickie! I need to make this! Very cute...and yo yo's are such a great take-along project! Vicki I love yoyo's and this is adorable! You are a busy bee! 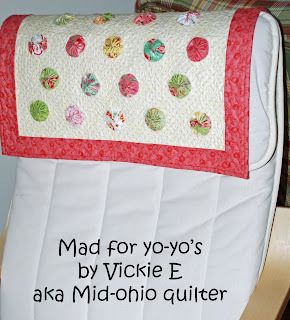 I think this is a great quilt to make with my daughter, 6, because she can help make the yo-yos and help sew them down.... I can finish the rest. Very cute! I have a couple of yo-yo makers and one flower.